Saying NO graciously is a hard skill to develop, especially if you enjoy helping people. Who wants to feel guilty or be considered rude? However, when you say YES to everything, reality is you eventually say NO to something more important. Have you ever thought about it this way? Since forward is the direction of success, if you want to be successful in life and business, you have to learn the Power of No. You have to learn how to say NO to decisions that will cause you to stand still or move backwards, and YES to decisions that will help you live it forward. This does not mean you have to say NO to everything that is not 100 percent mission critical, but you will have to learn how to say NO when saying YES is strategically unwise. In Episode 014 of The Live It Forward Show, Kent Julian talks about the Power of No and shares three ways to say NO nicely without burning bridges or feeling guilty. 2. How to book paid speaking engagements—Speak It Forward Boot Camp. 4. 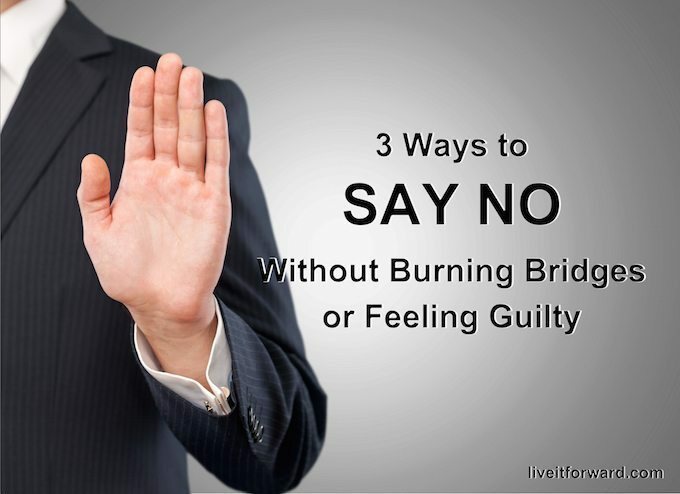 Three ways to say NO without burning bridges or feeling guilty. If you tell people you will think about it and get back with them, take responsibility and get back with them. If someone wants an explanation, you do not have to give a dissertation. 6. Take Action: What strategies have helped you learn to say NO without burning bridges or feeling guilty? Please share your thoughts in the comment section below. Kent is speaking at a conference hosted by the Entrepreneur Organization this week. Goal Getting Video Coaching Program — Set and ACCOMPLISH your goals! Thank you for listening to this episode of The Live It Forward Show. Do you have any feedback, questions, or ideas about this episode? Feel free to leave a note in the comment section below. If you enjoyed this episode, be sure to share it by using the social media buttons at the top or bottom of this post or by clicking on one of the tweets above. Sharing is caring! Ratings and reviews are extremely helpful and greatly appreciated! They help with the ranking of the show, and I read every single one of them. So please leave an honest rating and review for The Live It Forward Show on iTunes.